Do you have defective tires? How would you know your tires should be recalled? While many may suspect their tires are defective because they have had a tire failure, that isn't really a recognized way to know for sure. US DOT National Highway Traffic Safety Administration does make official determinations on which tires are in a group that might fail. They do issue tire recall orders just as they issue recalls for other suspect defective automotive components. A major problem with tires, however, is that according to a brand new report only 1 in 5 tires that are subject to a recall are actually replaced. The suggested primary reason for the low replacement rate is blamed on the low level of tire registrations that are submitted by either vehicle sales outlets or retail tire dealers. I bet if you think back to the last set of tires you purchased either for your car, truck or RV you were not given a form to complete and mail in to ensure that you would be notified in the event there was a recall issued by NHTSA. This might also apply to the purchase of the tires that came on your RV. I know that my RV dealer didn't have a clue when I asked them, so I went online and registered them directly with the tire manufacturer. I have written a number of times on the importance of filing a complaint with NHTSA when you suspect a tire was defective. NHTSA makes a decision on starting an investigation or not, based on complaints received and the seriousness of the consequences of a tire failure. So while you may think the failure is important, unless there are a number of complaints on file there will likely never be an investigation started and with no investigation there is almost certainly not going to be a recall. You need to remember that posting information on an RV forum grousing about tires while sitting around the campfire may make you feel better but it will never result in an investigation or recall or real improvement in the quality of tires applied to RVs. I have also written a few times here on the importance of registering your tire and these two topics Registering and Recalls are closely related. If you haven't registered your tires, it is never too late to do so. It doesn't have to be done when new -- it's just easier. Review my posts on the process. You can contact your tire dealer and ask about registration. If they can't or won't help, then I suggest a simple Google of "Tire Registration" will provide the information you need to complete the process. Of course, a letter to NHTSA, 1200 New Jersey Avenue, SE, West Building, Washington DC 20590 about difficulty you may have in registering your tires might spur them to address the problem outlined in the article. As Pogo said "We have met the enemy and he is us". When it comes to making the minor effort to file a complaint when you have a tire failure and to ensure you will be notified in the event of a recall by submitting the card with the appropriate information to register your tires, we RV owners as a group certainly have nothing to be proud of. Subscribe to the weekly RVtravel.com newsletter or one of our other newsletters about RVing. Great information and advice. Now in our 15th year. Learn more or subscribe. How to recognize what might be a better tire to consider buying for your trailer application? - Many tires have essentially no warranty, others maybe 12 months and some for years. In my opinion (IMO) the length of time the tire company is willing to stand behind their products is one way to judge the real quality of what they make. Which would you consider a better deal: a hammer with a 30-day warranty for $5, or one with a 10-year warranty for $10? - Speed rating molded on the tire sidewall to me indicates the manufacturer has made a real effort to exceed the minimum performance requirements from DOT. IMO, tires with a speed symbol are probably better than those without a speed rating. - Here is a chart to convert the speed symbol letter to a number. - The speed symbol letter is part of the service description which comes right after the rim diameter in the tire size. Technically, an "LT235/75R15 107/110 Q Load Range D" is a different tire than an "LT235/75R15 Load Range D" -- with the 107/110 being a load index for dual and single application and the letter Q being the speed symbol. - I note that most LT tires made today have a speed rating, but when applied to trailer application, some companies say to consider 75 mph as a max. - I also have recently seen a few ST-type tires now being manufactured with a speed symbol which IMO would make them probably a better choice than tires without a speed symbol. "I'm a firm believer in a TPMS, but with that being said, I have a digital gauge. I set my pressure from that and then read from the TPMS I have installed. That has given me the plus or minus of the system which they claim can be plus or minus 1 or 2 PSI. Blowouts seem to happen no matter what precautions you take. I have been to the scales I know that I'm not overweight, I know that I have even wear. I know what my cold PSI is. So what then is a person to do more than that? I do not have control over the manufacture process, so you trust the dealer and data that they supply. So why are trailer tires so much more susceptible to blowouts than tow vehicle tires? 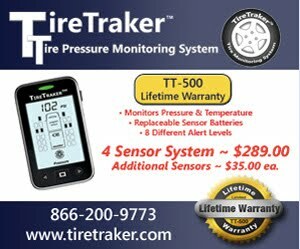 A TPMS system cannot predict a sidewall blowout. To me that has to be the cord or construction of the tire itself. It will give me a pressure loss and then you still have to slow and pull off in a safe area that's where the damage occurs. So what are we to do or what do you recommend about that scenario. Thanks for all your help." By "blowout" I will assume you are talking about "run low flex failure" of the sidewall and not the completely different "belt separation". As such if you can avoid driving at highway speed after the tire has lost significant inflation you can avoid having a run low flex failure, i.e., blowout. So it follows that if you stop driving on a tire after it has lost 30 to 50% of inflation or more, then you will avoid having a sidewall blowout. I know of no part of the tire manufacturing process that can somehow manage to place "defective" material in a consistent circumferential line only in the upper mid sidewall. Also to my knowledge, no one has been able to identify exactly what the "defect" is that is located at the site of the melting. Melting of polyester cord can occur no matter the size or number of cords if the sidewall is overstressed (bent) at a high rate. It does, however, take probably about 10 to 20 minutes for the temperature to rise to this level. This type of failure will and has occurred in all brands, so again, what is the exact defect. In steel body tires we see the same circumferential line with signs of fatigue failure of the steel cords when they are run when significantly underinflated. The reason trailers have a higher rate of sidewall flex failures than tow vehicles or motorhomes is twofold. First, a tire losing air on a tow vehicle provides the driver the opportunity to feel the change in ride and handling but provides no such tactical feedback if on a trailer. Second is the internal structural stresses that trailer suspension design place on its tires that are not experienced in as high a level in tow vehicle or motorhome applications. Interply shear is about 24% higher in trailer application than in a motorized vehicle. I suggest you check the Label list on the left side of this blog and review the posts that have a label "Blowout" if you want to learn more. Recently was asked why some dealers want to go with the minimum inflation needed to carry the load. I think the most likely reason for specing the minimum inflation is the belief that customers are more likely to complain about harsh ride even when they are getting better tire life and better MPG. They can feel ride immediately but not see the benefits of inflation to minimum +10% psi at once. I am also in favor of +10% so you don't find yourself chasing your tail every day by adding 1 or 2 psi when it gets cooler when you find yourself 1 or 2 psi low, or bleeding off 1 or 2 psi when the weather turns warmer. With +10% it would be easier to discover you are low a couple psi and simply wait till the next fuel stop, where there should be high pressure air available. 1. Measure the pressure when the tire is at ambient temperature (not warm from driving or being in sunlight). 2. Note the number of psi you want to add to each tire to get to your goal inflation. 3. When you get to a fuel stop measure the warm pressure. 4. Add the number of psi from #2 to the warm pressure in #3 and add air till you get to at least this new warm pressure goal. This "rule of thumb" will work for pressure changes of 5 psi or less. If you find you need to add 5 psi there may be something wrong, i.e., a leak -- and this needs to be investigated ASAP. Don't get hyper about being 1 or 2 psi off. Remember, if you have a 10% cushion, you are good to go as long as you are within a few psi of your goal. What is the optimum tire pressure? Load inflation tables identify the minimum inflation for a number of specific load placed on the tire. Tire sidewalls tell you the maximum load capacity for a given tire when inflated to the maximum pressure for that load range in that size tire. Optimum implies we have common agreement on which performance requirements we feel are most important. Optimum also implies that there is agreement in the inherent trade-offs of the numerous performance characteristics. If the only performance we are concerned about is load capacity and if we want the maximum capacity possible for the size and load range of a specific tire, then we have a situation where the optimum inflation is the maximum for the load range, which is also the minimum inflation specified in the tables. If, however, we do not need to support a load that corresponds to the tire's maximum load, then it is possible that other performance criteria may be considered and as a result there will be trade-offs to arrive at a new optimum. If we are talking about motorhomes, there are normally performance characteristics other than just load capacity. Some might be fuel economy, noise, ride comfort, tread wear, steering response, etc. Inflation pressure will affect each of these characteristics — some positively and some negatively. So clearly the "optimum" depends on the clearly understood and agreed on priority of these and other characteristics. As a tire engineer I suggest that people select an inflation pressure that will provide at least 15 percent extra load capacity over the heaviest loaded tire on an axle. All tires on an axle should run the same cold inflation. The above will still provide acceptable ride and provide improved durability and fuel economy. For multi-axle trailers I would consider improved durability, i.e., reduced chance of failure, to be of primary importance. So in this application, the "optimum" inflation pressure would be the pressure on the tire sidewall associated with the maximum load capacity. Even if you are not loaded to the max load you want to lower the "interply shear" forces as much as possible, as trailers induce much higher shear forces than seen in similarly loaded tires would if on a motorhome.